Are you shocked to learn I’ve been cheating on my fountain pens and with something as mundane as a marker no less? 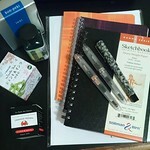 Yep, that ubiquitous writing instrument, the Sharpie, has wheedled its way onto my desk. It started when a few letters never arrived at their destinations. Not a huge loss but fountain pens traveling around the world are another matter. Enter the Sharpie. At first only parcels received the benefit of permanent ink. There’s nothing like good, thick lettering to inspire confidence that there will be no confusion about the destination. But soon I was addressing everything with these simple but colorful markers in hopes the envelope would arrive even if rainwater devastated the letter inside. At least my friends would know I was thinking of them even if they didn’t know what I was thinking. Sure, there are other options. Two options are candle wax and Micro Glaze each thinly layered over ink. A little odd-looking but better than naked ink. Then there are inks that can endure a water bath and come out looking much as they went in but they also need to be used regularly to flow well. Organization flies out the window when life gets hectic and a special-needs ink could easily get forgotten leaving a terrific nib clogged with a nasty mess. Too much trouble in my book. By contrast the Sharpie will wait patiently until needed and never complain should it lay neglected for a significant period of time. That’s perfect for my lifestyle. So I’ve adopted a couple packets of Sharpies for addresses and a few other special purposes. They may do nothing to improve my letter forms, especially in the way a stub or flex nib can, but it is the best solution to a quick bit of permanent writing. Shhhh. Don’t tell my fountain pens though. A hissy fit from a sputtering nib is not a pretty sight and an awful mess to boot. tut, tut…you can easily convert a preppy refillable marker to an eyedropper and at least use the fun inks. Noodler’s ink includes this configuration with Kung te Cheng…just a thought. Gentian – Some of those Sharpie colours are quite pretty and they don’t feather even on cheap envelopes. Can’t say that for some of my fountain pen inks. Need to explore permanence on various surfaces. Doodling could take on a whole new dimension. Will nothing be safe? 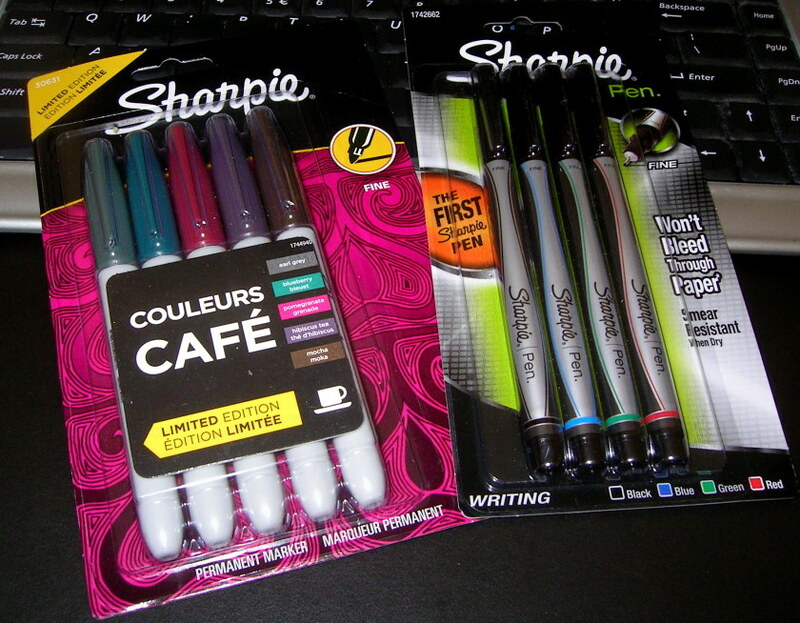 Early this summer I started using the Sharpie Pens when I didn’t feel comfortable carrying around a fountain pen. I keep them in our mini-van, with my Moleskine cahier on my bicycle & in my fanny-pack. I also use them for underlining in my Bible & underlining & marginalia in other books. No bleed-through! The Sharpie pens are ….. great. I hate to say it but I love mine. It makes me sad to watch my beautiful fountain pens sit idle while I use a *GASP* marker. I use the ultra fine points in a variety of colors. One can clearly see my writing on any colored paper. And, I also address my envelopes with them.